The application area of plastic gears has grown significantly in the last decade. The requirements from the industry, to design stronger, lighter, quieter and more efficient gears, have also motivated plastic manufacturers to produce custom made materials. In the last two years, the new VDI 2736 guideline for the design of plastic gears, was introduced. Unfortunately, its material data for lifetime calculations is limited. In order to design gears with custom made materials, it seems necessary to measure the fatigue data and temperatures in gear tests prior to the gear design. If you are interested in this topic: This paper (in English) presents an accelerated testing procedure for plastic gears that is based on different levels of testing. 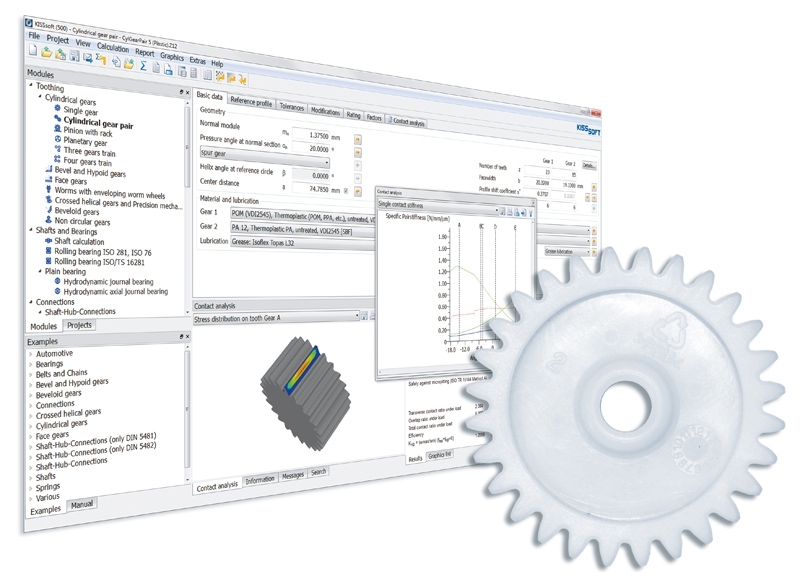 As a supplement to the VDI 2736 guideline, the calculation of plastic deformation and wear of plastic crossed helical gears (according to Pech) has been implemented in the KISSsoft Release 03/2016. Would you like to participate in the PolyTrib 2016? The 2nd Polymer Tribology conference is taking place in Ljubljana, Slovenia and we are glad to announce our sponsorship and participation as an exhibitor. There are also sessions dedicated to polymer gears. So come and see us or visit one of our trainings on “Small Gears in Plastic”.